We would like to say a big thank you to all the outstanding students who attended the 2018 Student of the Year Awards. Each and every one of you has committed to their training this year and gone over and above what is expected of the average student. Almsot one hundred students were nominated by the Instructor team and trained at a fantastic seminar put on by Paul Wolstencroft Sensei 5th Dan and Hisham Saif Sensei 3rd Dan. They were each awarded a large trophy by their Class Instructor to recognise their hard work and dedication. You are the people who make our Club what it is, highly successful and one of the largest and fastest growing Clubs in the UK and a highly valued member of the number 1 Shotokan Organisation in the World the JKS. We hope that you all enjoyed the seminar on the day and learned a lot. Both Instructors delivered really energetic and well planned lessons, fantastic job! Well done. Big thanks to Michelle Baron and Paul Towler who once again were kind enough to snap away all afternoon and really managed to capture what a fantastic occasion it was. Mike Sensei has speedily processed the images and they are now available for you to view and download free of charge. Thank you both so much, your work is amazing and we know how hard you both work without adding this extra job in! It is much appreciated by us, the students and the parents. Great job. These photos are all fab, thank you so much for taking them We are very lucky indeed that you kindly do this for us. You always manage to capture the fantastic atmosphere at these events! As well as some fantastic training sessions we also had the pleasure of watching all four of last years winners do Kata demonstrations. Abby Fielding, Ellis Pindoria-Stott, Kevin Longthorne and Connor Cherry Sensei all delivered outstanding performances and reminded us exactly why Paul Sensei chose them last year. All three have continued to work hard, lead by example and develop into even stronger karateka. Well done. We closed the seminar with a presentation of awards to our fantastic Instructor team. Without our Instructors, we would have no Club, we wouldn’t be able to put these great events on and the karate that is being passed down to the students wouldn’t be half as good. They are a group of selfless and committed Individuals who work so hard together as a team to learn, inspire and bring through the next generation of brilliant students. They train hard every single week, sweat buckets and get shouted at by Paul Sensei just like their students do. They are students of the sport just like you and their hunger to learn and desire to continue to progress is the reason why we as a Club are so successful. Paul Sensei and I have been able to train Japan and the World Headquarters twice this year between us. Our Instructors cover our classes and enable us to continue to develop and learn and keep moving this Club in the right direction. We truly are blessed to have you working alongside us, above all you are all really lovely people. Thank you all so much for everything you do. 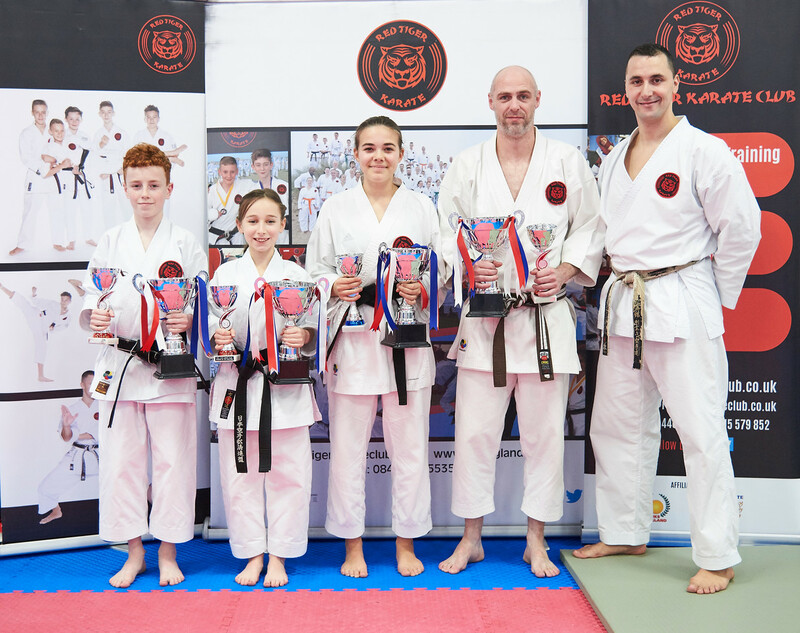 All of our Instructors then awarded their nominees with Student of the Year trophies before Paul Sensei gave out the top four prizes. Paul Sensei chose Jaime Pratley, Isabella Baron, Georgie Dyal and Andy Matanle. I will put a write up about all four of these very deserving winners on the Student of the Year page. Massive congratulations to you all. Well done to following students who were awarded trophies by their Instructor, there may be a few names missing, so if you can’t see yours, I do apologise, please let me know via email to info@redtigerkarateclub.co.uk and I will add you to the list. Christoper Jones passes Assistant Instructor Course. Well Done!